HALLIE EPHRON: One of the nicest things about traveling to book festivals is the authors you meet. At the Los Angeles Book Festival this year I found myself sitting next to Anne Cleeland. We had a lovely chat, and I tried but could not get her to move to Boston ("We've got water, lots of water," I said!) The best I could do was bring her to Jungle Red. Anne writes mysteries laced with romantic suspense. Her New Scotland Yard Detective Sergeant Kathleen Doyle gets romantically entangled as well as ensnared in murder investigations. Kate is a newly minted detective, an Irish redhead of humble origins and modest means. The object of her affection is Chief Inspector Acton, a British lord who has established himself as a brilliant but enigmatic figure with a knack for solving London’s most high profile homicides. And oh my, did opposites attract. I asked Anne how she came to her blend of mystery and romance. ANNE CLEELAND: The “defective detective” is a familiar trope in many mystery stories—the protagonist has relationship problems stemming from a tragic past and/or substance abuse, mixed in with generous amounts of cynicism and bitterness. After seeing the worst that society has to offer, the sleuth has become a dysfunctional loner, dragging emotional baggage around like Marley’s ghost. Elizabeth George, one of my favorites, would fit right in; both of her characters are so lovelorn that the storylines thread through multiple books like a soap opera; Lynley yearns after his best friend’s wife, Havers yearns after her married neighbor, and the odds definitely don’t favor a happily ever after. 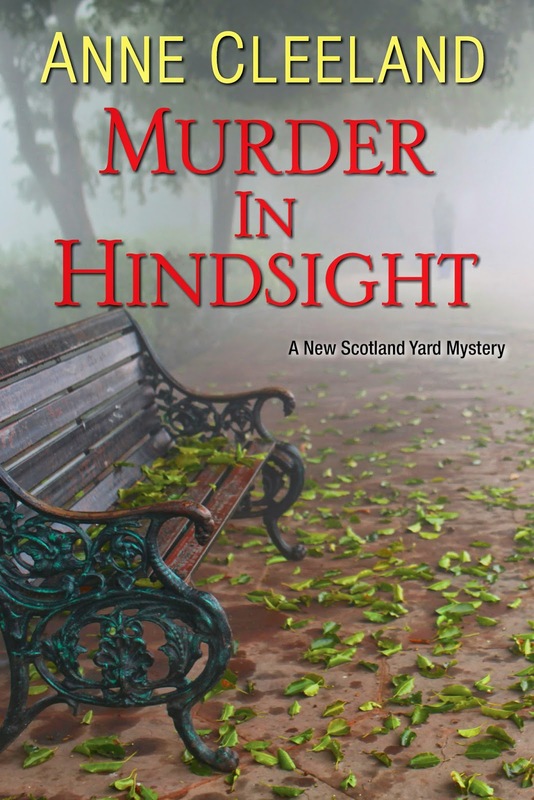 My Scotland Yard detective has a romantic relationship with her superior officer that is fraught with ethical dilemmas—she’s discovered that he’s something of a vigilante. What to do? She loves the man, and he loves her (maybe a little too much) but on the other hand, she’s sworn to uphold the laws that he’s breaking on a regular basis. So, I’m with Shakespeare; give me a protagonist who loves not wisely, but too well—moping is for losers. Just ask Marlene Dietrich. HALLIE: Sounds like New Scotland Yard has a lovelorn detective falling for a defective detective and trying to make it work. Fascinating idea! What are the romantic attachments in crime fiction that have stayed with you? Anne Cleeland is a lifelong Southern California resident, and currently makes her home in Newport Beach. An attorney by trade, she's been reading mystery and romantic suspense since her Nancy Drew days. The Acton & Doyle series features two Scotland Yard detectives, and if you are a fan of Masterpiece Mystery, you may enjoy their adventures. She also writes a historical series set in 1814 because she loves historicals, too. Being a romantic at heart, all her stories have a strong romantic element. There’s an unusual killer combing London’s streets—a vigilante is at work, killing suspects from prior cases who were never convicted; those who’d gotten away with murder, in hindsight. It’s a puzzler, though; this vigilante is staying to the shadows, and covering his tracks so that Detective Sergeant Kathleen Doyle is left to guess at his motivation. Is the killer guilty about his own role in helping murderers get off, or is it someone who’s just had-it-up-to-here with the imperfect justice system? Meanwhile, the crises keep piling up; Chief Inspector Acton, her husband, is up to something having to do with brassy female reporters and the heir to his estate, and when Acton is up to something, murder and mayhem are the certain result. Not to mention she’s needed to quash a messy little blackmail plot, and do battle with the dowager Lady Acton. All in all, it will make for a busy few weeks; now, if only the ghosts that haunt the manor house would leave her alone. . . Since I enjoy Anne's books, I guess I'm on the side of loving well if not wisely. I adore Julia's Russ and Clare . . . . I only recently discovered Kathleen and Chief Inspector Acton and am thoroughly and completely hooked on the series! So fun finding Anne here this morning - welcome. And, I agree, I like my fictional friends to love well - who cares about loving wisely? I think I own all of Ngaio Marsh's books involving Inspector Alleyn and Agatha Troy. And yes to Elizabeth George's messy soap. And Julia....yeah, I like some romance in my mystery. I think all of the Reds novels have an element (or more) of romantic attachment to someone who's wrong on some dimension. And loving unwisely is the best way, don't you think? Builds in tension which breeds conflict, the seasoning of crime fiction (or any fiction, really). Isn't this the reason Sherlock readers are so obsessed with Irene Adler, even though she's only in one short story? Most women Holmes barely notices and then patronizes, and IA is oh so wrong and oh so right. THey don't even kiss, and yet...! Welcome, Anne! So great to see you at Malice. And yes I have some experience with my characters in that arena, too. HOw do you do all your research? Do you travel, like Debs and Rhys and Susan? Our own wonderful Kathy Reel has been telling me to read Anne's series forever. So, much so that I own them all. I really need to make sure they move to the top of the TBR pile quicker. I really think we need to institute a mandatory reading vacation - one week of nothing but reading - every year for all employees. I really need more time in my life to read! Hallie, I think you're on to something with Holmes and "the woman." I too am a bit burned out on the "defective detective." I prefer folks who make, maybe not the best choices, but with a whole heart. I'm a huge Sherlock Holmes fan, and I always wondered what it would be like if Holmes fell in love--you know it wouldn't be a run-of-the-mill romance! So that's where the idea came from. So glad you like the story! The thing that makes romance so valuable in a mystery is that it adds interest and suspense. Especially when you have couples at odds with one another or who have a barrier between them. The detectives (professional or amateur) can't spend every scene in the book detecting, there have to be down times when they try theories and mull over answers that become new questions. And as for research, Hank, mainly I watch a lot of Masterpiece Mystery. It's appointment TV! That, and there's a nice officer at Scotland Yard who's steered me straight on a couple of points. He's handsome, of course--there's something about a man in a tall hat. . . I love the Doyle and Acton series. It was great to see Anne Cleeland interviewed here at JungleRedkWriters. I love to read series and so agree that the "mope and cope" gets old, at least for me, So finding this series has given me some great reading. Hi Anne--You know I love Acton and Doyle! I do think their particular characters make for a very interesting pairing. And I agree, too, that it's much more fun to read about characters who love well, if not wisely! Hallie and Anne, I am happy to discover a new-to-me author of mystery fiction. Thank you! What do I look for in crime fiction relationships… rather what are the romantic attachments my that have stayed with me? It's too easy to be depressed just by living. Since I don't need any help with that, I look for passion in a story more than anything else. I began to read mystery novels several years ago. Since then my current and most enduring devotion to reprising rolls is the romantic attachment between Gemma James and Duncan Kincaid in the mysteries by Deborah Crombie. Gemma and Duncan live just beyond my reach yet seem normal and real. Their relationship has what I have or had, and sometimes what I want or fear. All of these bits come together as I get to read about them in a context where their daily lives and their passion are framed in the extra ordinary. I love Deborah Crombie's series! I heard her speak once, and she told a great story about the Scottish husband she married on a moment's notice--it's a cautionary tale about loving not wisely, but too well! Anne Cleeland!!!!!!!! I cannot adequately express how much I love Anne and her Acton and Doyle series, but, of course, I'll still try to put in into words. I'll use some excerpts from my reviews to share my thoughts on this series. "There are few series that have engaged me to the point that Anne Cleeland’s New Scotland Yard Mysteries. Cleeland has the ability to bring characters to your heart and bind you to them. Kathleen Doyle is so full of wit and devotion to the people she loves that she continues to delight and charm in each book, making Acton’s obsession with her completely reasonable. Lord Michael Acton never disappoints in his commitment to Doyle and to a system of justice that serves up the guilty to their just desserts. Doyle and Acton have such a complete understanding of one another that the reader will develop strong protective instincts of his/her own. The supporting characters of the ever irritating DS Isabel Munoz and Doyle’s could-have-been boyfriend, now friend, DS Thomas Williams add so much to the narrative and the life of Doyle. The stories are so intricately plotted and layered that the action is always moving forward at just the right pace." "Anne Cleeland has created a captivating series full of intrigue and originality. The delightfully witty dialogue of her characters is not limited to the main characters' give and take of intellectual sharpness and Irish good humor. The entire cast is gifted with clever quips and interplay. I find myself rereading dialogue in various scenes just to experience the satisfaction of it again. Doyle is perhaps the most gifted, as even in dire circumstances, she seems to be capable of seeing the irony or insanity of it. And, her understanding of and acceptance of Acton's special problem is most welcome, as the reader doesn't have to spend time wading through misunderstandings and immature relationship issues." Kristopher, I am so happy that you have the books and are moving them up your TBR list. Alice (A. Wright), you and I have shared a love for Anne and her series, along with Merrily, since the beginning, and, of course, you have had the pleasure of Anne's company at dinner, something I hope to catch up on in the fall at Bouchercon. It's so much fun sharing the love. Anne, you know how big a fan I am! When we talk about romance in your books, it should be noted that it is definitely a unique romance, what with Chief Inspector Acton's "little problem." And, the mystery part of the series is top-notch, too. 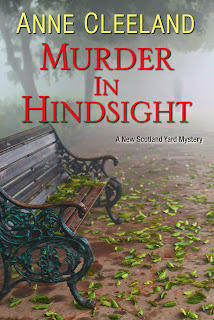 I still want you to be on my blog, Anne, and I haven't bothered you for a bit because I know how busy you must be with Murder in Hindsight having come out the end of March. I did send you the interview questions the first of April, but I'm certain now that you didn't receive them. Could you give me either here or email me (Kathy502@aol.com) your email address to make sure I have it right. I can't wait to feature you on The Reading Room and to see you in Raleigh. I hope all the Reds and others here that are attending Bouchercon can meet you, too. Prepare to be loved. Oh my gosh, Kathy, you are the best! Let's get together at Bouchercon, and I'd be happy happy happy to be on your blog--its a must-read! Anne, can you send me your email to my email at Kathy502@aol.com or message me on FB with it. I want to make sure that I send it to the right one. I'm thinking I need a sandwich board to wear at Bouchercon to advertise you and the series. Hehehe! Actually, a sandwich board would be great to put you and all the Reds on to show my love and dedication to you great authors in my life. But, there would be those awkward moments in the bathroom and maneuvering in the panels. Kathy Reel, you're a hoot, girl! Who needs a sandwich board when you can wear a specially-screened tee with all your faves listed front and back?! Oh, I so agree on the defective detective" (great phrase!). Although I tell people it's not that there's anything wrong with that, it's just that I don't feel like I can add anything in that realm. But love-lorn? Oh yes. I think even the toughest of heroes can be stopped in his tracks by the right woman. The trick for me has been to create the right character for my MC Hugo, someone as smart and feisty and independent as he is. I'm still crazy for Gemma and Duncan, even after they've settled down, sort of, and I like SJ Rozan's Lydia and Bill. Both raise the questions "how long can you keep them apart?" and "how can you keep it interesting after they get together?" But as usual, the Reds are great teachers by example! This is a fabulous series, a breath of fresh air for those of us who get tired of the tried-and-true dysfunctional detective or the "will they or won't they?" that goes on for five or six books. Acton and Doyle fall in love as if hit by "the thunderbolt" and proceed to leap straight into a highly satisfying relationship, both personal and professional. I love Doyle's intuitive, warm and headstrong nature, and of course, Action is a dish (and a fine homicide detective as well). I read the first book, immediately bought the second, and then tapped my foot until the third was published. One of the most innovative Scotland Yard procedurals in a long time, in my opinion! Reine, what a lovely comment. Thank you so much! That's what I like about Duncan and Gemma, too, and it's been so challenging and interesting to see what their relationship has developed. It's definitely being tested in the book-in-progress. Anne, this must be my week for saying, "Why haven't I read your books????" I know I would love your series. Should I start from the beginning? I very much had "not defective" in mind when I started writing Duncan and Gemma. I didn't want to spend my days with depressed alcoholics--as much as I love some of the fictional ones, especially--sigh--Morse. Nor did I want to do "love lorn." So much more challenging to have characters who try to make a relationship work! Hi Deborah, thanks so much for hosting me today! I think it is probably best to start from the beginning with Murder in Thrall--although each book can stand alone,there are unavoidable spoilers. Hope you enjoy! Add to that "romantic tension" mystery list: Dorothy Sayers' Peter Wimsey and Harriet Vane. A tension written so well in Gaudy Night when Harriet says that she fears "going up like straw" if ever she were to give in to Peter. FChurch, alas, the t-shirt would be much more practical. Of course, I then would miss out on people pointing and saying, "look at the crazy woman wearing the sandwich board." Hmm, authors, have you thought about hiring someone to wear a sandwich board touting your books at conferences. I'm willing to bet that there are some of us that would provide that service for free books. It certainly would be a unique marketing ploy. I have been a fan of Anne Cleeland since I received an advance reader copy months before Murder in Thrall came out! I sat reading into the night and had to try my hand at contacting her! Ans to y surprise she answered me right away! She is one of the most gracious women I know! And...my proudest achievement was having told her about the LA Festival of Books and her looking in to and telling me she was coming! AND to have met Hank Phillippi Ryan as well as the opportunity to meet Hallie Ephron and be at the signing when both Anne and Hallie were there! Anne's Acton Doyle series is outstanding..and of course I am Kathleen! I love Deborah's books (which I've been reading from day one) and especially enjoy the way Duncan and Gemma's lives have evolved to incorporate a family that we care about, too. As FChurch said, "I like some romance in my mystery," and it's really nice when it's not totally dysfunctional. How fun to see Hallie and Anne find each other: you are fab, ladies! (Which you know!) I knew Anne was another Holmesian but didn't know the link to Acton was that direct! I'm coming late to this post, because I just finished (mere minutes ago) Anne Cleeland's MURDER IN THRALL and had to look her up on Facebook. Anne, we sat at the same lunch table on the first day of CCWC and you handed me your book and said to read it if I would like to, and then tell you what I think of it. Now, of course, I am searching Amazon for the next book! PS: Nice epilogue too - it explained the creepiness a bit. That was exactly the way I reacted to "Murder in Thrall" when I read it - at first I couldn't believe what I was reading, and then when I got to the "startling reveal" I was dumbstruck. Such a fresh and original take on the traditional Scotland Yard procedural (and romance). I love this series. Apparently Anne's publisher is reluctant to publish her fourth and fifth books! what a crying shame. Someone please find her a publisher immediately so we can continue to understand Doyle and Acton! I love Kathleen and Acton!!! I love Russ and Clare and Duncan and Gemma!!! I laugh,I cry but I am always moved and inspired by their love stories!! !Please keep writing Anne, Julia and Deborah...thank you from the bottom of my heart!!! !